An Indian Family lived in the Town by the name of Kan-is-ta-naux and an old pamphlet lists the following quote: “I am a real Indian Doctor. My mother Mrs. Mr-tal-ic-awk from one of the large tribes of lower Canada, recently died at the age of 90 years and with the experience of her, my mother, who has become so celebrated for her knowledge of Medicine among the different nations, uniting all these I have gained the inestimable blessing of giving relief to the afflicted. I make all my Medicine and Cure in the Indian mode of Curing. My Medicines are all made of Plants, Roots, Flowers, Seeds, Barks, Gum Balsams, Oils, Extracts, Cordials, Liniments, Ointments, Powders, and Salves.” Her name was Mar-le-ah Kan-is-ta-naux. Some of the cures listed were for the following: Asthma, Bleeding of the Lungs, Catarrah, Consumption, Croup, Dizzy Spells, Enlarged Heart, Headache, Itch, Liver Complaints, Poor Blood and Rheumatism. Patients could obtain treatment for $5 per month. She drives sad complaints away. 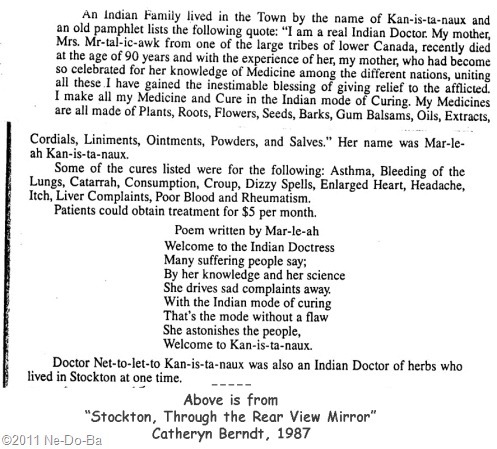 Doctor Net-to-let-to Kan-is-ta-naux was also an Indian Doctor of herbs who lived in Stockton at one time. If anyone out there has any idea where I might find this brochure, PLEASE leave a comment with details. My first though was to contact Ms. Berndt and ask her where it is located but a Google search lead me to a memorial page at Find-A-Grave. She passed away in 1993. My guess is it would be located in the personal effects of Ms. Berndt or at a local Historical Society. I would love to get a scan of the entire document for our archives. So now I have located more “Indian Doctors” in the family, Marleah and her mother. I hope all my readers took a bit of time to read the “Indian Doctor” materials I mentioned in a prior post. If not, now would be a good time, so here are those links again. The “Doctors” page at Ne-Do-Ba and the Belmont Newell pages. At this time in history the general public had preconceived notions of what “Indians” should be (which seldom had anything to do with reality). The Native People selling products and services to the general public had to meet those expectations in order to make sales. As a result, “Indian” publicity perhaps consisted of some facts and much hype. This brochure is an attempt by Marleah to sell her doctoring skills to the general public. She mentions the recent passing of her mother, so it was probably printed about 1876. How much is fact and how much is hype? She and her mother are both Native American women. She learned herbal cures from her mother. Her mother was known as Mrs. Mr-tal-ic-awk. Marleah made her own medicines using natural ingredients. Her mother was “celebrated for her knowledge of Medicine among the different nations”. Marleah was able to “cure” all the diseases listed. I want to point out to my readers this document is not a historical document. It is local history published long after the events it describes. However, if the brochure still exists, it would be historical documentation since it was crated during the lifetime of the people I am researching. Until I can verify this information with historical documentation, I can not assume it is factual. However, there are a couple of items that appear to collaborate a possible connection between Marleah and Metallic through his daughter Parmachenee. The first item is the name Marleah gives to her mother, Mrs. Mr-tal-ic-awk. If you drop the last syllable and sound it out, you have Metallic. The spelling of Metallic is found a dozen different ways, so I am much more concerned about the sound of the two names rather then spelling. Based on sound, they certainly do match well. The second item is the location given for her mother’s tribe as Lower Canada. The Abenaki groups are very numerous in certain areas of Quebec, New Brunswick, and Northern New England in the late 1700s and early 1800s. Metallic was known to be Abenaki and to have family ties with the St. Francis Tribe (Abenaki of Odanak) in Quebec. There is one point against the theory. I have never come across any mention of Parmachenee, Metallic, or other family members being healers. In Western Maine, we certainly do love our “Indian” healers. We celebrate Molly Ockett, an “Indian Doctress”, every year in Bethel and have numerous locations and businesses named after her. Metallic and Molly Ockett where contemporaries and known to be friends. I am concerned the subject of healing never comes up in our local Metallic legends. This healing element of Marleah’s story is not a good match with our local knowledge of Metallic’s family. Did you happen to catch that last sentence in the Stockton history? “Doctor Net-to-let-to Kan-is-ta-naux was also an Indian Doctor of herbs who lived in Stockton at one time.” Is this the same person as “Dr. Lee O’netto” mentioned as the sister of Henry? Is this a man or woman? Have I uncovered yet another Doctor in the family?